The person mentioned in the “Goat King” blog was not struck by a car but actually fell off of her bike around 11pm. Active Trans staff did some research regarding the cyclist mentioned in this blog. According to the 17th Police District, the only traffic accident reported in that area on July 27, 2010, occurred at 11pm at 3318 W. Lawrence. There was a cyclist who had fallen off of her bike and was taken to the hospital where she was treated for a bump to the head. Initial reports into 911 speculated that a vehicle was involved, but the statement that the cyclist gave the police negated that fact. No fatalities or other bicycle related incidents occurred in that area on that date. I'm not sure what Goatking was thinking in speculating about what had happened. What is even more disturbing is that a main stream media source, Chicago Redeye/Chicago Now, allowed this falsity to be published on its website. A hit and run motorist left a female bicyclist laying unconscious in the street near the intersection of Kimball and Lawrence last night, according to Chicago Redeye blogger, Goatking. In his first hand account, the blogger describes a "gruesome" scene in which the woman lay seemingly dead in the street near "the wreck of metal that was once her bike" with her "groceries still strapped onto the handlebars" as police and EMTs worked to care for her. Click here to read Goatking's post. A Chicago bicyclist was injured on July 15th when he violently collided with a car while riding on the Lakefront Bike Path (LBP) where the trail crosses West Wilson Avenue. Our law firm has been retained to represent him in his claim against the driver who failed to yield to bicycle traffic. Our client was riding southbound on his Schwinn road bike along the LBP at the time of the collision. As he rode the path across Wilson Avenue he slowed his pace and looked around for moving vehicles. Bicyclists, in-line skaters and others who typically use the path are not required to stop before crossing the road. However, eastbound and westbound traffic is controlled by stop signs. Visibility is excellent and drivers would have no reason not to see cyclists using the bike path. The incident occurred at around 6:15 p.m. on a beautiful, sunny evening. As the cyclist peddled across the road, the driver suddenly pulled in front of him, seeming to ignore the stop sign. Though he immediately grabbed his brakes, our client was not able to avoid the vehicle, a 2007 Toyota Corolla, and was thrown onto the car's windshield then onto the street on which he struck his head and shattered his hand. Fortunately, he was wearing a helmet. The bicyclist was taken from the scene via ambulance to Advocate Illinois Mason Medical Center, a level one trauma center, where he was admitted and received treatment. He is currently expected to require several months of healing and rehabilitation. We are, of course, taking this matter very seriously and will aggressively pursue the at fault driver and make sure she is held accountable. Last night I participated in a legal round table discussion about bicycling and the law with criminal defense attorney, Ian S. Kaspar. The prime focus of the informal meeting with concerned cyclists was to talk about the light sentences recently handed out to two men who intentionally struck cyclists with their car in Brookfield. Though he did not represent either of the men accused, Ian did a wonderful job of explaining the in's and out's of the criminal justice system, especially with regard to sentencing. It was satisfying to hear that the punishment handed out by Judge Kipperman was not as insignificant as it sounded at first. In short, both men are now felons and that tag is something that will profoundly affect each of them for the rest of their lives. Ian explained that perhaps the silver lining in all of this is the new relationship that has apparently been created between the State's Attorney's Office and the Active Transportation Alliance which initiated a letter writing campaign that has brought media attention to this case. We may now hope that the prosecutor's office will let the ATA know in advance of sentencing in future cases, which in turn can communicate with the broader cycling community. According to Ian, even a modest presence of concerned bicyclists at a sentencing hearing can make a difference when a judge is considering punishment for an attack on a cyclist. Gather - After gathering yourself, and your bike, it's time to gather as much information at the scene as possible. While you have your mobile phone out, click a few photos of whatever it was that caused your crash, e.g. the driver's vehicle and license plate, the road hazard, the broken bicycle component, etc. If there are people around you, ask if anyone saw the accident. If so, get their name and telephone number. If you were struck by a motor vehicle ask the driver for his or her name, address and telephone number. Ask to see a driver's license and insurance card. Shortly after being involved in bicycle accident you may be contacted by a representative of an insurance company who will ask you to give a recorded statement. Questioning will focus on how the accident happened and the nature and extent of your injuries. This is most likely to occur where you have been hit by a motor vehicle. You may even be contacted, in person or via telephone, while you are still in the hospital. Do not give a statement until you have sought legal advice. Why? Because you need time to recover physically and collect your thoughts before making a statement to which you will be bound later. You may not at that point even fully appreciate the full extend of your injuries or the care and treatment that you will need. There is no good reason not to wait before giving a statement. The driver's insurance company may even make a quick offer to settle your claim and ask that you, in return, sign a document releasing its insured from further liability. Do not do it without seeking legal advice. Again, there is no good reason not to wait until after you can fully appreciate what happened and what the repercussions are or will be. The driver's insurer will want to take it fast to resolve the claim quickly for as little as possible. You take it slow. Talk to a lawyer - Speak with an attorney even if you believe your injuries are minor. It should be noted that following a cycling accident you may not be best served by seeking legal advice from Uncle Bernie who handles bankruptcy cases. Seek advice from a personal injury lawyer, preferably one with experience handling bicycle accident cases. The initial consultation with an attorney should not cost anything. If the attorney decides to take your case, he or she will -- or should -- only receive a fee when and if the case resolves in your favor. This is called a contingency fee agreement. A lawyer is most likely to agree to represent you when your injuries are severe, with significant medical bills. Again though, call a lawyer even if your injuries seem minor. When I've received such calls I spend time offering guidance on how I think the victim should proceed, then recommend that he or she negotiate with the driver's insurer on their own. There may be no point in an attorney taking a piece of the pie in a claim that can be resolved quickly and easily for a relatively small sum of money. Loss of consortium/society; that is their loss of the love, guidance and services you would have provided to them. Ninety-nine times out of a hundred, monetary compensation is paid by the at fault person's, or entity's, insurer rather than out-of-pocket. Litigation - Sometimes it is necessary to file a lawsuit in order to wrest fair compensation from the at fault person's or entity's insurance company. Generally, this occurs where the insurer believes that its insured is not at fault based on the facts, or where there is strong disagreement over the amount of compensation that the injured bicyclist should receive. It can also occur where the at fault person has "substandard insurance," coverage from a crumby insurance company that tends to litigate every case in order to delay payment for as long as possible. Depending upon the type of accident at issue, the attorney will take differing steps in his or her investigation. If the accident involved a motor vehicle, an accident reconstruction expert may be retained. If the crash was caused by a defect or hazard in the roadway, a different sort of expert may be consulted. In a product liability case, involving failure of a bicycle component, an engineer or metallurgist will probably need to be retained. Most bicycle accident cases, however, do not require retention of experts. A thorough and aggressive investigation of the facts by the law firm will suffice. In all cases, the cyclist's medical bills and records will be obtained from care providers. After the lawsuit is drafted, filed and served on the defendant(s), your attorney and the defendant's attorney will trade written questionnaires called interrogatories, request production of relevant documents, photos and other materials, and interview all those involved in the matter, including parties, witnesses, physicians and experts, in a deposition. After that, the matter will proceed to trial if a settlement agreement cannot be reached. The vast majority of cases filed settle without going to trial, but trials certainly do occur. It is important to make sure you hire an experienced trial lawyer just in case. Criminal prosecution - In bicycle accidents involving a motor vehicle, the driver will often receive a traffic citation and will need to appear in court to defend himself or herself. What happens in the traffic or criminal case will have little if any bearing on what occurs in a civil lawsuit. In fact, I have successfully resolved bicycle accident personal injury cases in which the at fault driver was found not guilty of violating the motor vehicle code. Thanks again to Ian and to everyone who came out last night. If you find yourself in need of a criminal defense attorney click here to view Ian's contact information. He handles cases throughout the Chicagoland area. There will be an informal legal round table tonight at Quencher's Saloon, 2401 North Western Avenue, Chicago, Illinois from 9:00 p.m. to 10:30 p.m. The discussion will feature criminal attorney Ian S. Kasper who will "help illuminate the internal workings of the justice system as it relates to the unfortunate events which took place when a pair of drivers recently hunted down cyclists in Brookfield and escaped with outrageously light sentences." While the focus of the round table will be the criminal justice system, I will also be there to answer any questions regarding the legal protections that the civil justice system offers to bicyclists. Click here to learn more and to RSVP. Chicago's Soles and Spokes blog reports that the Pedestrian and Bicycle Information Center (PBIC) has created an online library full of bicycle and pedestrian safety videos. Very cool stuff. Check it out by clicking here. Illinois Governor Signs Bike Safety Bill Declaring, "Road Belongs To Everyone." Declaring, "The road belongs to everyone," Illinois Governor Pat Quinn signed tough new bicycling safety legislation into law yesterday in a ceremony held in an Arlington Heights bike shop. The law, to take effect January 1, 2011, strengthens Illinois' anti-buzzing law which prohibits motor vehicles from passing less than three feet from a bicyclist on a roadway, by providing for criminal penalties. Sentences are to vary depending on whether injury results. The new law also provides for the creation of "Share The Road" license plates to be purchased through the Illinois Secretary of State's office. Fees for the plates will be used to fund a bicycle safety education program. Governor Quinn Signing Bicycle Bills from Julie Hochstadter on Vimeo. Felt Bicycles and the U.S. Consumer Product Safety Commission announced the recall of several 2009 Felt road bike models due to faulty steering tubes. 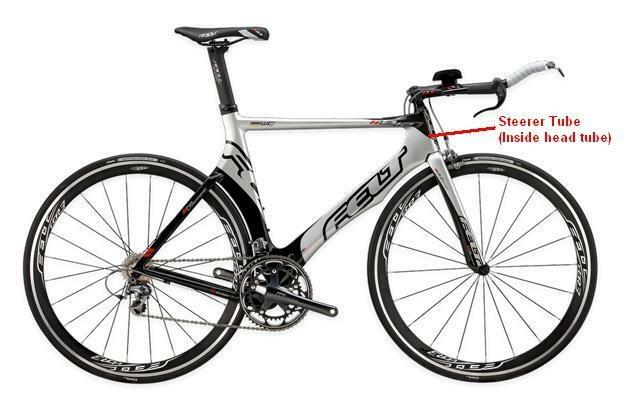 The recall affects Felt time trial/triathlon models B12, B16 and S32. The company has received seven reports of the bikes' aluminum steer tubes breaking. The steer tube inserts into the head tube, connecting the folk to the bike's frame. Click here for more details.